I suspect that few monarchs or rulers in history have lived as lavishly as the current President. At times, he very well fulfills the mantra, “Eat, drink and be merry!” President Obama seems at times to practice a religion very popular during the time of the birth of Christianity. It is called emperor worship. It obviously rests on the premise that the emperor is a god and worthy of worship. The Roman Emperor perceiving himself as a god lived like he thought a god should live and demanded allegiance. This didn’t mean the emperor thought he was “the” God but only that he was one of the gods. As long as citizens worshiped him, they were free to worship other deities also. It is important to note that Christians were not massacred necessarily because they worshiped Jesus as Lord; they were often killed and persecuted by Rome because they proclaimed that Jesus is the only Lord – and the emperor is not a god nor are the idols worshiped throughout the empire. They were killed for refusing to bow down to Caesar. A Christian is a person who worships the Triune God alone through Jesus Christ and the Holy Spirit. As the President vacations at the exclusive Martha’s Vineyard, plays golf and parties with other administration gods, celebrities and CEO’s, what is the state of affairs in this country and abroad? Over a thousand people have been killed in Egypt during his vacation. Churches are burned, Christians are targeted for killing, the Muslim Brotherhood vows vengeance against all. The military responds with brutality. Iraq, Afghanistan and Libya, like Egypt, exist in chaos contributed to by America’s intervention and foreign policy incompetence. Syria, neighbor to our ally Israel, continues in civil war. Genocide continues to threaten Southern Sudan. The President made a brief statement about Egypt in which he basically said, “Sh*t happens…What are you gonna do? I’ve got a tee time and a party to attend.” To borrow from Pascal’s Pensees, “This man, born to know the universe, to judge all causes, to govern a whole state, is altogether occupied and taken up with the business of catching a hare,” or in this case chasing a white ball around. It would seem that the President is content with the above international affairs. Is this America’s destiny, too? For the President, it is still “good to be the king”—to quote Mel Brooks. What does bother the President? He seems fine with an economy creating more and more people dependent on…wait for it…the government of which the President is the head. He seems in favor of generating and facilitating the attitude and practice among Americans that the government is the best and only hope for provision, healthcare, moral guidance, education and justice. Rather than inspiring people to raise their hands to God in praise and prayer, this President teaches people to put out their hands to the government. And the masses are only too happy to give him what he wants. The only thing that seems to rile the President’s complacency is dissent. What about worship? This President has claimed to be a Christian (and he may be one), but has his life indicated faith that Jesus is the Lord? Like the Caesars, he seems to tolerate Jesus being a lord, as long as Jesus conforms to the President’s agenda of emperor worship that includes unlimited celebrity worship, unrestrained abortions, unrestrained sexual immorality, unrestrained accumulation of debt and waste, and a foreign policy that is unrestrained in its undermining of Christianity abroad. As that agenda proceeds, the President parties and plays golf. The rule of the day is the President’s self-righteousness and arrogant lifestyle that affirms every sort of idolatry of self. Augustine asserted that the mantra for the Christian is “Pray and give.” A life blatantly opposed to the “Eat, drink and be merry” lifestyle embraced by the President. The President has made himself an enemy to the Roman Catholic Church – the largest body of believers in the world. For a Christian, Christ and his rule must come first. For the President, a selfish, anti-Christian agenda comes first. The Catholic Church is the largest provider of healthcare in America. The President threatens all of them and their charity. For what? For the sake of the poor? No, for the sake of his controlling agenda and to the detriment of the poor and sick. A President who thinks this way uses the IRS against those who disagree with him. He uses the Justice Department according to his own whim and agenda. He creates a healthcare system for the purpose of control and power that diminishes actual healing and compassion. He abandons those who fight for the country. He disburses taxpayer dollars to those he blesses and who bless him. He completely ignores Jesus the Lord in all of his foreign activities and domestic policies. He continually seeks opportunities of self-aggrandizement, flattery and pampering. He avoids any demonstration of competencies and relies on image makers, deceptive defenders and fervent finger pointing. His goal, like any brute beast, is not to serve but to be served and to luxuriate in self-preservation. Yes, I am saying that this President and the government he leads seem to play the role of the emperors of old described as beasts due to their opposition to the Kingdom of God. According to Scripture (the word of authority for Christians), antichrists go out, beasts arise one after the other, false prophets deceive the people, and masses worship the beasts and are led astray from the one, true God. Many in the churches are led astray to worship at the altar of secular idolatry, as they compromise their faith in Jesus to accommodate an equally earnest faith in the government, an equally passionate partisan loyalty to a political religion, and a keen awareness and knowledge of the politically inspired, self-aggrandizing mantras of the hour. This kingdom of the President and government of the United States of America is not the people of God. It is sadly opposing the rule of Jesus Christ and his kingdom. The people of God exist and have great freedom in this country, but this country is not the nation of God or the people of God. Christians must emphatically proclaim and declare that we are citizens of heaven first, ruled by Jesus Christ the Lord. We live as citizens of this country, too, and will serve as the Lord leads for the good of all. We will give to Caesar what is Caesar’s, but we must dare not give to Caesar what belongs to God alone. We must worship Jesus as Lord and reject whatever contradicts his rule and the revelation of Scripture. Whose name is written upon our heads and hands? The Lord’s? Or do we belong to someone or something else? Our hope is in Jesus. Any hope in this government or this President is foolishly placed in vain. This President appears like any celebrity living for self. Christians must contribute to the building of the Ark with Noah and his family and prepare for the boarding, because the skies are filling with dark clouds. Christians must turn their eyes from the government’s exaltation, turn their faith from this government’s promises of hope, and turn their hands from reaching for more from this government and turn them in praise to the one, true God. If you are a Christian who has abandoned your first love for Jesus and his kingdom, has compromised with Caesar’s demands, has allowed your garments to become soiled in sin and worldliness or has been more loyal to any other thing than Jesus, then repent and turn to Jesus alone as Lord. This reality calls for “patient endurance” and “wisdom” by God’s people. The church must continue in the Lord and be built up and established in faith in Jesus, so that we can be faithful even unto death—but at least unto denying ourselves, accepting inconvenience, giviing ourselves to prayer and demanding holy lives for ourselves and Christians. We are to be partners with those Christians enduring persecution and tribulation elsewhere in the world. This is why any lifestyle exuding the mantra “Eat, drink and be merry” is absolutely antichristian and rejects the Scriptural teaching of the body of Christ. We Christians in America are one with those in Egypt suffering. We are one with those in China oppressed. We are one with Pastor Sayeed in the Iranian prison for his faith. We are one with those hiding in Syria. This is why it is hard to imagine a Christian who is the “most powerful man in the world” that could basically say “Oh well” and go play golf while churches burn. This is the type of behavior of a man like one who will one day beg for Lazarus to dip his finger in water and reach it down to hell to quench his thirst–not a man following the Lamb who was slain and now sits on the throne of heaven. Which kind of person are we? 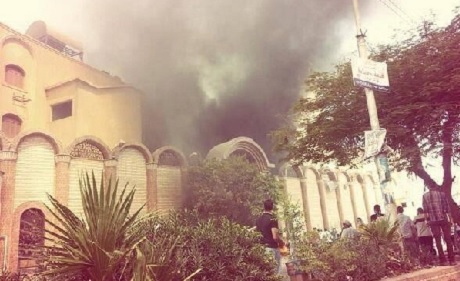 St. Saviour’s Anglican Church in Suez, Egypt on fire at the hands of rioters.